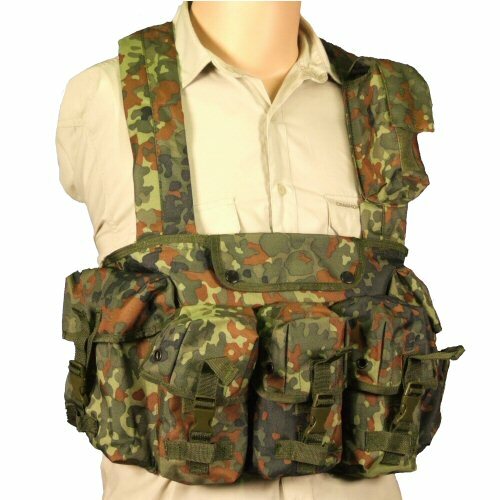 The Flecktarn Miltec chest rig is based on the classic design of three ammo pockets in front, two utility pockets on either side, document pocket on top and a torch or FFD pouch on the left chest strap. This design is tried and tested by forces worldwide and has been found to be the most effective way of carrying a field load on the chest. 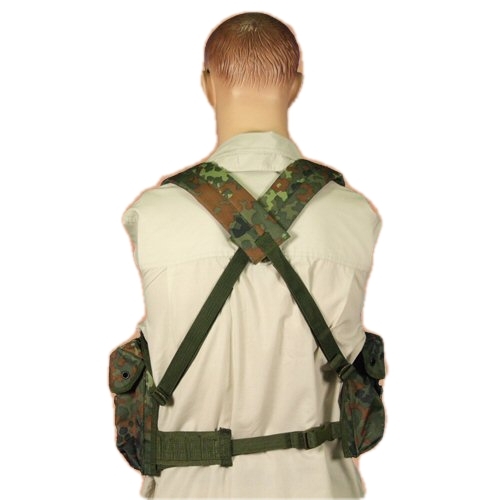 The chest rig is sometimes worn over webbing as a way of carrying a double load of ammo and effectively using both the chest carrying capacity and the waist carrying capacity. The chest rig pockets all open with silenceable velcro and adjustable quick release buckles with the exception of the document pocket and FFD pocket. Each ammo pocket can hold up to 3 M4/M16 magazines or 2 G3/M14 magazines or 2 G36 magazines. With the lid stretched to full capacity, it can also take 2 AK47 magazines. The lid and body of each ammo pocket has a rivetted drainage hole. The utility pockets on either side are wider and taller than the ammo pockets, but retain a low profile so as not to get too much in the way of the natural downwards position of the arms when worn. These can take a US quart water bottle, general field utilities and spare ammo. The document pocket is opened with two press buttons and reveals a flat pocket which is the size of the whole body of the chest rig. The FFD pocket is long and thin to fit on the 60mm width of the chest strap. This can carry a small NATO dressing or a small angle torch. The straps are padded over the shoulders and upper back for comfort and weight distribution and the back of the strap is made of plain 25mm webbing only to reduce bulk. The adjustment points for the strapping are simple plastic ladder sliders on the upper left and right sides of the rig and a back strap is provided running from the lower left and right points. This strap can be opened on the right side with a quick release buckle as the left side is fitted with a 50mm wide section with vertical loops for insertion of a limited number of ALICE type webbing pouches. The chest rig body and pouches are made of thick PU coated 600D nylon for water and dust resistance. View of rear of chest rig showing the crossover of the shoulder straps and the rear strapping.